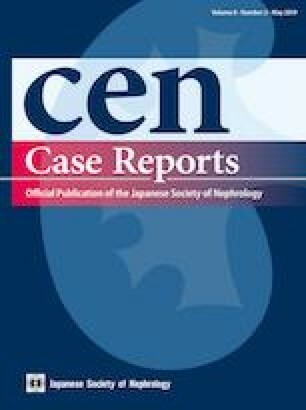 Anticoagulant-related nephropathy (ARN), a significant but frequently undiagnosed problem in patients receiving anticoagulation, is found to be associated with increased renal morbidity and all-cause mortality. While ARN is mainly associated with warfarin use, recent case reports suggest that it may also occur in patients taking direct oral anticoagulants (DOAC). We report a patient who had a history of alcoholic liver cirrhosis and paroxysmal atrial fibrillation, and received dabigatran 110 mg twice daily for 1 year. He presented with gross hematuria and severe acute kidney injury with an international normalized ratio of 4.09. Dabigatran was stopped and he was put on temporary hemodialysis support. His renal function gradually improved when the hematuria subsided. Renal biopsy later confirmed the presence of red blood cell casts inside the renal tubules with features of IgA nephropathy. Finally, his renal function returned back to baseline level. As DOAC has been increasingly used nowadays for the treatment of various thromboembolic diatheses, regular monitoring of renal function is warranted, especially in patients with underlying glomerular diseases and coagulopathy such as chronic liver diseases. All the authors declare no competing interest.